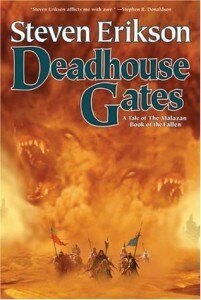 If Gardens of the Moon was an intriguing but imperfect introduction to the Malazan world then the second book, Deadhouse Gates is where the series really hits its stride. It is not really a direct sequel to the first book, although it does take place shortly after the events described in Gardens of the Moon it is set on a separate continent, the land known as Seven Cities which was conquered by the Malazan Empire a generation ago. The Malazans see themselves as having given the Seven Cities peace and prosperity after years of endless tribal warfare and suffering under the rule of despotic religious cults, but the people of the Seven Cities still see the Malazans as foreign invaders and they seize the opportunity of the Empire’s declining strength to launch a rebellion lead by Sha’ik, the prophetess of an apocalyptic cult devoted to destruction. The rebellion is widely supported by the local populace and the Malazans quickly find themselves besieged in their strongholds, principally Aren, the largest of the Seven Cities. Aren’s mighty fortifications are sufficient to hold off the ragtag armies of the rebellion but the Malazan forces in the rest of the continent have more of a problem. The main plot threat follows the Malazan 7th Army who, surrounded by enemy forces with superior numbers, face an overland march of 1500 miles through hostile lands to get to the safety of Aren. The bulk of the 7th Army’s strength is made up of Wickan cavalry, expert horsemen from a tribe on the Malazan’s home continent who have long fought for the Empire. Individually their soldiers are more than a match for any of their enemies but the 7th Army’s leader, the Wickan warlord Coltaine, also has the problem of protecting the lives of fifty thousand Malazan settlers who face certain death at the hands of the rebels if they are not protected by his army. The story of the march and the series of battles the 7th army faces along the way is probably the most compelling plotline in the entire Malazan series featuring many memorable scenes and multiple varied, convincing and well thought-out battles. Gardens of the Moon occasionally suffered from the fact that it was hard to really care whether the Malazans succeeded, but here they are more clearly the good guys in the story as they seek to protect innocent civilians from the vicious tortures of the rebels (of course, the Malazans also possibly deserve criticism for their war of conquest that lead to them controlling Seven Cities, but few of the Malazan characters in this novel were involved with that). The climax to the plotline is also one of the most powerful moments in the entire series. Although the 7th Army’s march (the so-called ‘Chain of Dogs’) is the biggest plotline in the book there are also a number of other plotlines taking place, all of them occurring during the Seven Cities rebellion. One focuses on the character of Felisin Paran, a teenage daughter of a senior noble family exiled to the harsh Malazan prison camp of Otaratal Island after the Empress launches a cull of the noble families. To survive in the harsh prison she finds herself doing some unsavoury things to survive but eventually escapes in the company of Heboric, a former senior priest of the God of War has lost his faith and former soldier Baudin. Their escape takes them on an eventful journey, including a frankly bizarre encounter with a giant jade statue buried in the desert which sets in motion a series of mystical events which leave them trapped on a ship filled with mysterious corpses in the flooded alternate dimension of an unknown Warren. Meanwhile, several characters from Gardens of the Moon have chosen a poor time to come to the Seven Cities, as the former Bridgeburners, assassin Kalam and sapper Fiddler pass through on their way to try to take revenge on the Empress they believe betrayed them. Kalam finds his loyalties torn, between his mission of revenge and his almost-forgotten loyalties to his homeland, before joining the Bridgeburners he had been a native of Seven Cities and feels compelled to try to aid Sha’ik’s rebellion. Along the way they will encounter a number of other characters with their own agendas such as Iskaral Pust, the seemingly mad High Priest of Shadow and Icarium and his companion Mappo. Icarium is one of the series’ more interesting characters, a seemingly amiable half-human half-Jaghut warrior with great power but no memory of his past who is constantly driven to journey and to try to remember where he came from. Mappo is his friend and constant companion, but is also charged with making sure Icarium remains ignorant, since he knows that his friend is potentially very dangerous and has in the past brought down whole civilisations in made rages. Other encounters deal with the mystical Path of Hands, an ancient ritual followed by the Soletaken, people who have the ability to change into animal forms, often losing their humanity and sanity in the process. The supporting plotlines vary in quality. Some elements of them are well-executed, Icarium and Mappo’s storylines is one of the more interesting in the series (although the events in this book are just the first instalment of it) and Felisin is in some ways one of the series’ best bits of characterisation – in a series filled with powerful warriors and mages it is an interesting contrast to spend so much time on a character who is in many ways very weak and suffers through some terrible and unjust ordeals. Felisin is not really a very likeable character due to her understandable bitterness at what she sees as her abandonment, but she is a believable character even when sometimes does some fairly stupid things. Other parts of the story are less satisfying; the plotline concerning the Jade Statue that Heboric and Felisin encounter is frankly incomprehensible and despite being revisited several times in later books has yet to really make any sense. The Path of Hands subplot is a bit more comprehensible and does have some interesting bits in it but it is difficult to really see the point of including it in the novel as it doesn’t add much to the story. The overall quality of the writing has improved since Gardens of the Moon and most of the time the characterisation is better as well, although there are still some moments where character motivations are a bit difficult to follow – Kalam’s decision to take time out of his mission to help Sha’ik get a critical religious relic seems a bit out of character given his characterisation in the rest of the series. In summary, Deadhouse Gates competes with the third book Memories of Ice for the title of the best book in the series. The central Chain of Dogs plotlines is probably one of the most entertaining, compelling and memorable Epic Fantasy storylines and many of the supporting plotlines are also interesting, although the quality does dip at times (the bizarre Jade Statue plot being one example that detracts from the overall quality of the book). It is not a perfect book, but is still an excellent piece of Epic Fantasy.